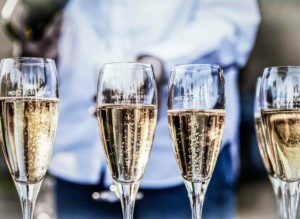 Read on to discover a brief (but bubbly) history of champagne! Legend has it, that when Dom Pérignon invented the first sparkling champagne, he shouted aloud to his peers, “come quickly, for I am tasting the stars!” The validity of Pérignon’s statement is up for historical debate, but the French Benedictine monk did make important contributions to the production of champagne wine at the end of the 17th century. Have you always wanted to learn more about your favorite effervescent beverage? Read on to discover a brief (but bubbly) history of champagne! Before the rise of champagne, red wine was considered the standard throughout France and parts of Europe. Benedictine monks in the Abbey of Saint-Hilaire recognized the unique grape-cultivating potential in the Champagne region of France around 1530. The northern location and cool winds brought distinct flavors out of the chardonnay, pinot noir, and pinot meunier grapes that grew in the region. The monks bottled the wine before the initial fermentation stage ended, which accounted for the famous fizz. The recipe was experimented with for several years, incorporating sugar and increased fermentation. Champagne had circulated throughout France and beyond for over a hundred years until Widow Clicquot, the famous Champagne producer, stepped onto the scene. Due to the fermentation used to create the bubbling beverage, the wine appeared cloudy and displayed pieces of dead yeast. The earliest wine bottles were even painted and mottled to hide the unattractive effect! Clicquot’s innovations, along with modern engineering, allowed European winemakers to create a champagne that was as aesthetically pleasing as it was delicious. During the “beautiful era” of France, often associated with the end of the Franco-Prussian War, champagne became a mass-market luxury item. While it was once saved for the European elite, champagne was now more readily available to the public. La Belle Époque was a period of optimism and regional peace, especially in Paris, and the champagne flowed like a river! Today, champagne is synonymous with celebration. It’s enjoyed at New Year’s Eve parties, weddings, birthday parties, romantic dinners and more. Champagne is not to be confused with other sparkling wine counterparts, such as Cava or Prosecco! When you reach for a glass of champagne, ensure that it hails from the Champagne region of France — and toast to your good fortune! Experience an exhilarating European adventure on the Cosmopolitan, Explorer, the Euro Focus tour, and more! This entry was posted on Wednesday, February 6th, 2019	at 10:50 am	. You can follow any responses to this entry through the RSS 2.0	feed. You can leave a response, or trackback from your own site.